Time flies and we have come to the last few hours of 2012. Soon it will be a beginning of a brand new year. Was quite surprised that I did so much postings  during the year which means that I have been very 'hardworking' in the kitchen, lol. This is also an indication that I have also ate such a wide variety of food [do check out my whole year's postings if you are interested to know what I have had this year]. Lucky-leh to be able to enjoy so much food but hope they are healthy too. Anyway, I'm happy that I have accomplished this much during the year, at least it's time well spent. Here I wish to thank all my readers and many fellow food bloggers especially Cheah [No Frills], Esther [the Fuss Free chef], Phong Hong [Phong Hong Bakes], Veronica [Minty's Kitchen], HHB [Happy Home Baking], Sonia [Nasi Lemak Lover], Happy Flour [here] and many more for sharing their tested recipes, valuable comments, advices, ideas on cooking and baking. Looking forward to see more of these in the brand new year. 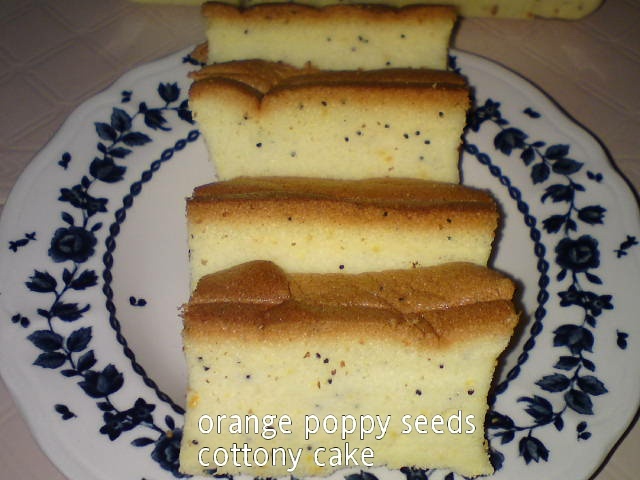 Another cottony, soft cake with orange flavour. 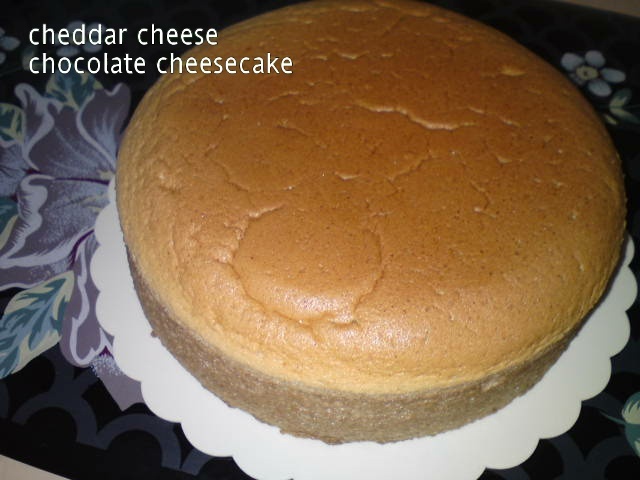 Nice cake which I baked for Autumn Solstice Festival which falls on 21 December 2012. 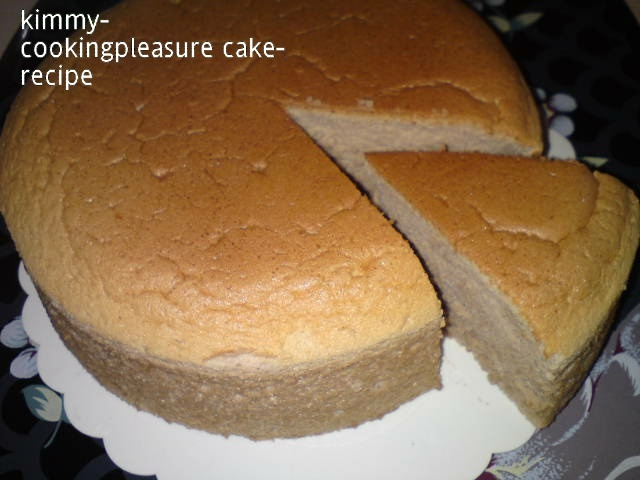 The cake shrinks a little but soft and cottony like the other cottony cakes which I have baked. I like the citrus flavour of orange and slightly salty taste. Place the dry ingredients in the mixing bowl and make well in the centre. Add in eggs, corn oil, orange juice and zest. Using a paddle hook, beat ingredients until creamy and well combined. 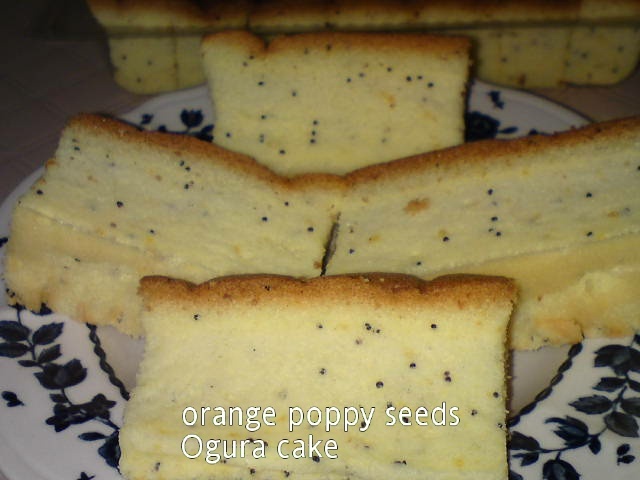 Add in poppy seeds and mix well. Set aside. 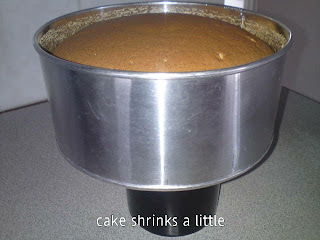 Pour into a 8" square tin [line base with baking paper at the bottom only]. Smooth the surface with a spatula and steam bake in oven at 160 degrees C for 70 minutes. [Note: for the water bath, use 1 and 1/2 cups water for the duration of baking. This way the cake base will be dry after baking]. Invert the cake after baking and let it cool slightly [about 10-15 minutes] before removing the pan and baking paper [there maybe some vapour on the baking paper]. Cool cake before slicing to serve or refrigerate for serving later. 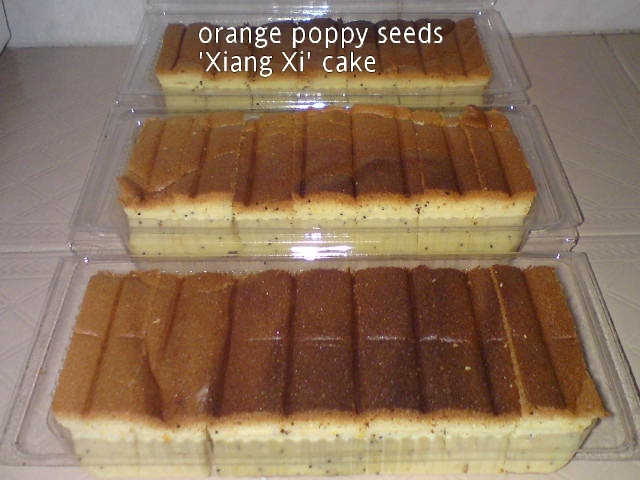 Original recipe was from Min's blog [Orange Poppy Seed Xiang Xi Cake] with some modifications to the method. 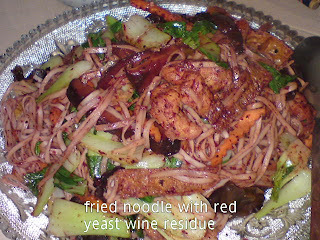 A healthy fried noodle dish using 'ang chow' [red yeast rice residue] after I cooked the Fried Rice with Red Yeast Rice Residue. 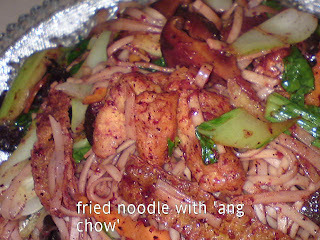 This is a meatless fried noodle which I believe is light and good for our body especially after days of indulging in meaty dishes. Easy cooking for a weekend meal. Blanched dried noodles until cooked, drain and toss with a little sesame oil. Heat frying pan with sesame oil, add in mushrooms and wood ear fungus. 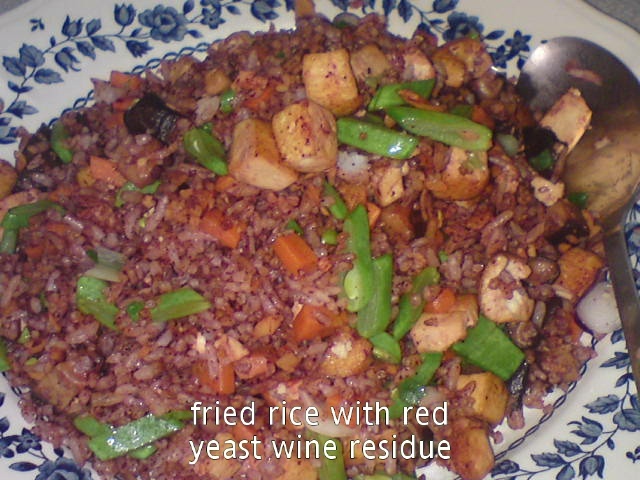 Fry for a second, push aside and add in red yeast rice residue. 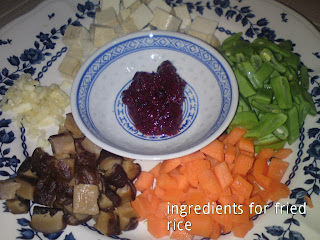 Fry until aromatic then add in tofu puffs and carrot. Stir fry and add in seasoning. Add water, bring to a boil and taste to adjust seasoning. Add in blanched noodles and vegetables. Continue to stir fry until all ingredients are well mixed and the water is almost dry. Baked another cheddar cheese cheesecake again but this time with chocolate flavour. The cake didn't shrink much. Using double boil method, dissolve cheddar cheese with butter, then add in melted chocolate and milk. Mix well and set aside to cool. 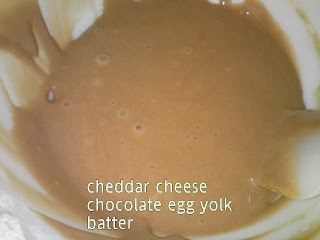 Sieve flour into a mixing bowl, add in egg yolks and cooled melted cheese and butter mixture. 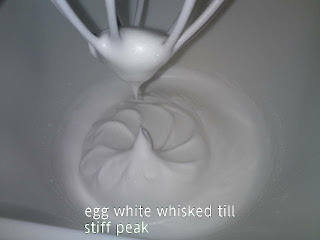 Whisk on medium high speed until creamy and ingredients are well combined. Set aside while you prepare the egg white and preheat oven at 150 degrees C.
In another clean bowl, whisk egg whites until frothy, add in cream of tartar. Continue beating and gradually add in sugar in 3 batches. Whisk on medium high speed until soft to stiff peaks formed. Pour half [1/2] meringue into egg yolk mixture. Mix well to incorporate ingredients. Then pour into balance meringue. Mix well. Pour batter into a lined loose bottom 7" round cake tin. Smooth the surface with a use of spatula. Steam baked [use 1 1/2 cups water] in baking tray. Baked in preheated oven at 150 degrees for 70 minutes. Remove from pan immediately to cool on rack [cake base is firm and dry]. This time I left the baked cake in the oven to cool for 1 hour before removing and standing cake on a pedestal to cool further. Chill cake for several hours before slicing. Think I'm getting lazy and just will settle to prepare food the easy way out with less preparation and cleaning up. 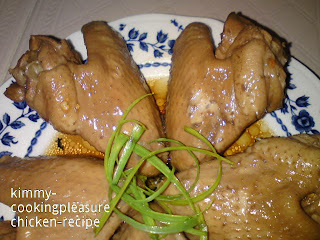 This chicken dish is an easy dish to prepare yet suitable for the young and old. For more flavour, just dip in your favourite chilli sauce and enjoy. The braising sauce can be stored, refrigerated and reuse to braise other meats. Bring water to boil. Add in all the spices and liquid ingredients. Boil for 5-10 minutes until aromatic and fragrant. Add in the chicken wings. 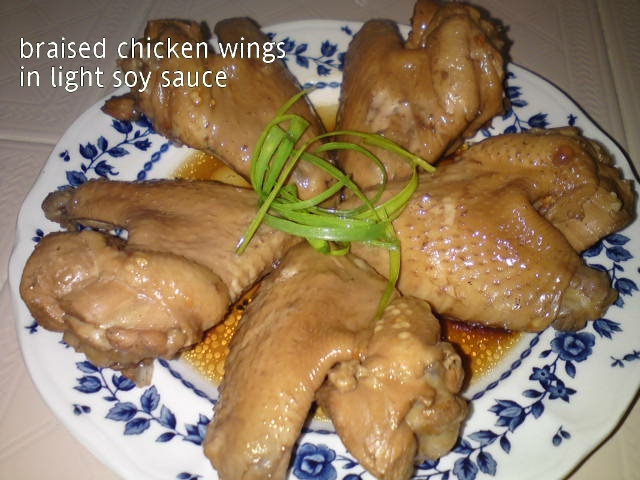 Make sure the liquid is enough to cover the chicken wings. Bring to boil again, then lower heat to simmer for 10 minutes. Cover and leave until serving time. Weather is quite humid these days during the day. Not in the mood to cook too much especially frying but still need to fill up the stomach, LOL. 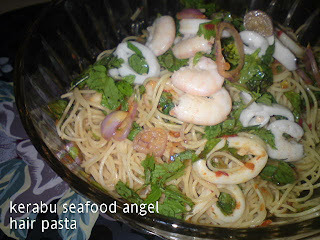 So here's a dish which I can prepare ahead of meal time, light and easy. Boil some water [enough to blanch seafood] in a small saucepan. Blanch prawns and squids until cooked. Remove and set aside. Keep some stock to mix with seasoning. Mix the seasoning together with the stock in a large mixing bowl. Toss in the blanched seafood and all the ingredients. Mix well and add in the cooked spaghetti. 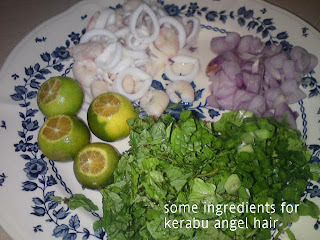 Mix well and serve immediately with extra sambal belacan. Pound all ingredients together using a mortar or blend coarsely in a food processor. Store in a small container and refrigerate for later use. These are soft, moist, fluffy and healthy buns good for breakfast or teatime. 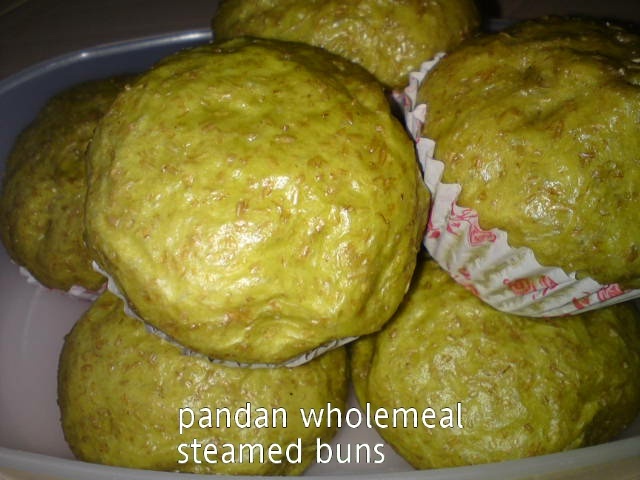 These buns can also be steamed plain without any filling and serve with meat burgers. Combine and mix yeast mixture in a mixing bowl. Stir well and leave aside for 10-15 minutes. Then add in pau ingredients [except shortening]. Knead into a smooth dough before adding in shortening to knead until elastic [dough is soft and sticky]. Cover and leave to proof for 15-20 minutes or until double in size. Punch down and divide into 2 equal portions. Shape each into a ball. Then divide each portion into 4 equal parts. Roll into round balls. Flatten each ball into round circles. Wrap each dough around chosen filling and shape into any shapes preferred [I made them into round buns]. Place on paper casing and leave to rest for 30-40 minutes or until double in size in steaming trays. Steam the buns over rapid boiling water for 10 minutes [if using normal steamer]. I steamed the buns from cold water for 12-15 minutes in an electric steamer, then leave for 3 minutes before removing from steamer. Serve immediately or cool on wire rack before storing in airtight container. If freezing buns, thaw to room temperature and steam for 10 minutes before serving. Looks quite a weird fried rice but the taste is good and very healthy. If you see the ingredients you would understand what I'm trying to say. This rice dish has at least 5 colour ingredients. Someone told me if you eat 5 coloured food daily, your body [5 main organs] is well taken care. Heat sesame oil, saute ginger until fragrant. 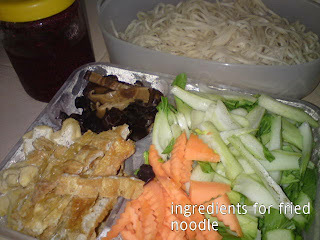 Add in mushrooms, beancurd and carrots. Fry for several seconds, then add in rice and all the seasoning ingredients. Toss and stir fry until well mixed. Add in the green beans or mixed vegetables. Continue to fry until vegetables are cookd through. Taste to adjust seasoning. Dish out to serve immediately. 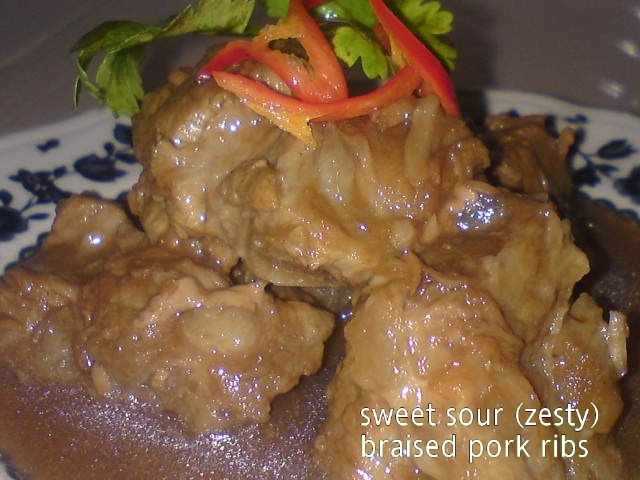 A zesty sauce pork ribs recipe that needs sometime to braise until the ribs are tender before adding sugar. The braising sauce can be used to cook chicken, pork, fish or prawns. The only adjustments needed are the quantity of water and cooking time. 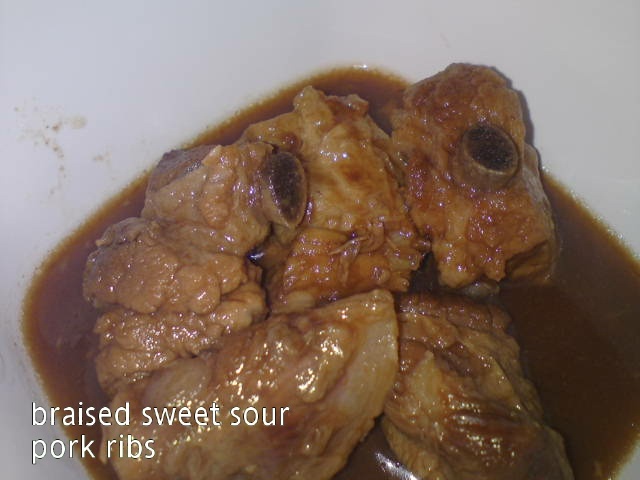 Wash and blanched pork ribs in boiling water for 5-10 minutes. Drain away water and rinsed pork ribs. Marinate with vinegar, tomato ketchup and soy sauce for several hours or overnight. Bring water to boil, then add in the marinated pork ribs together with the marinade. Boil over high heat for 10-15 minutes, then reduce to lower heat and simmer until ribs are tender [may need to add more water if ribs are not tender enough]. When pork ribs are tender, add in the sugar. Cook over high heat to reduce the gravy or thicken with cornstarch. 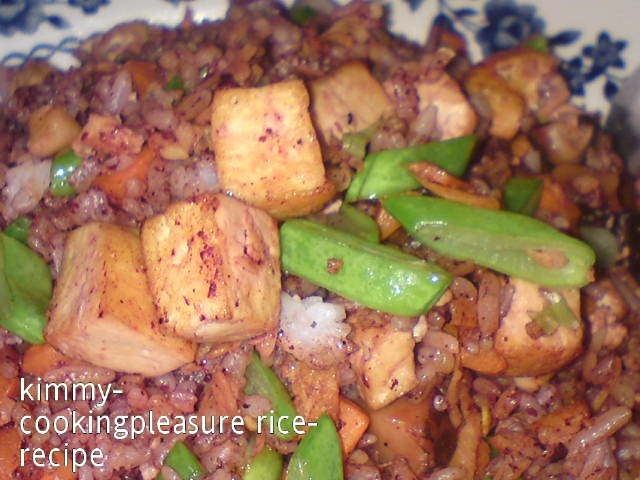 Garnish with spring onions and serve with steaming hot rice.